Estimates of Canadas oil reserves jumped from 4.9 billion barrels to 180 billion this year, making the country the second-largest oil reserve in the world, according to an annual survey conducted by the Oil and Gas Journal. The change catapults Canada ahead of Iraq in terms of reserve size, and decreases OPECs share of the worlds oil reserves by more than 10 percent. An electric shovel loads a haul truck with oil sands mined from the surface of the Athabasca Oil Sands Deposit in Alberta, Canada. Syncrude Canada Ltd., the worlds largest producer of crude oil from oil sands, typically mines 155 million tons of sand each year. Photo courtesy of Syncrude Canada, Ltd. The survey, based on information provided by companies and governmental agencies, characterizes the current state of the oil and gas industry  both in terms of production and reserves. This year the journal included Albertas vast oil sands as part of Canadas oil reserves. We have known about the oil sands reserves for a while. We decided to incorporate them now because we recognize that they are economically viable, says Marilyn Radler, economics editor for the Oil and Gas Journal. In order for an oil resource to be termed a reserve, it must be possible to extract it profitably with existing technologies and under present economic conditions. The riches of the oil sands lie in bitumen, a thick and tar-like hydrocarbon mixed in with sand, water and clay. 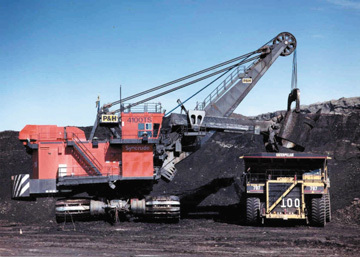 The most common way to excavate bitumen is to strip-mine large volumes of sand. Processing plants add hot water and chemicals to the sand to create slurries; bitumen floats to the surface while sand settles out. Traditionally a high-cost endeavor, mining for bitumen has become much more feasible over the past two decades with the cost for producing a barrel of oil now roughly $8. The U.S. Geological Survey estimates that by 2005, 10 percent of North Americas oil production will come from Albertas sands (Geotimes, November 2002). One of the main drivers behind reducing costs is a technology called hydrotransport. Rather than hauling oil-laden sands to processing plants by truck or conveyer belt, the new approach mixes the sand with hot water to create slurries that can be transported via pipeline. Despite technological developments, the Oil and Gas Journal estimate might be overly optimistic, says Naresh Kumar, chair of the American Association of Petroleum Geologists Resources Evaluation Committee. There is a significant potential, no doubt. Investors also appear divided over the short-term promise of the oil sands, especially now that Canada has signed onto the Kyoto Protocol. The protocol commits Canada to reducing its carbon dioxide emissions and could add costs to producing oil from the sands. Koch Industries, a U.S. energy company, recently withdrew from a C$3.5-billion Alberta oil sands project, citing Kyoto as the cause. In contrast, Shell Canada Ltd. recently began a C$5.2-billion project to tap into Albertas bitumen.